Casino Royale is a name that has been popularized in novels and movies, most famously the ones involving master spy James Bond. However, the Casino Royale of Las Vegas is a different casino where anyone can play regardless of the amount of money that they happen to have. It is a completely inclusive environment located in the world's gambling capital and it also is definitely a casino worth visiting. The location of Casino Royale is quite possibly one of the best locations in the entire city of Las Vegas . It is located on South Las Vegas Boulevard , placing it on the Las Vegas Strip. More specifically however it is located between Sands Avenue and Flamingo Road , placing it within crawling distance of the Flamingo, Caesar's Palace, Mirage, Treasure Island , Venetian and Harrah's Casino. These are all some of the brightest stars in the casino sky of Las Vegas and they are also the primary locations of some of the main entertainment venues in the city. Suffice it to say that the location of Casino Royale places it within walking distance of anything in the city you could want to do. There are many different table games available for you when you play at Casino Royale but the most famous table game of theirs has to be craps. They have a 100 x odds rule on craps when you play there and this rule allows you to win big in certain situations. They also offer roulette, blackjack and other major table games if you want a little bit of a different choice. 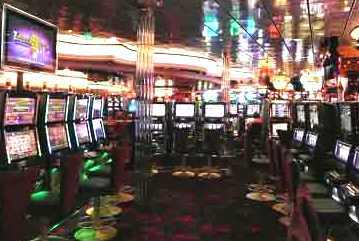 While table gaming is pretty big at Casino Royale, it is really the slot machines that have all the action. As they have proven again and again, Casino Royale slot machines are some of the loosest slot machines in the entire city. In fact, the casino itself has been voted the number one place in Vegas to strike it rich and no casino can get that honour without having some fantastic slot machines available. Not only are the machines loose, but you get a great choice of games with Wheel of Fortune, Jeopardy, Jackpot Party and many of the other best slot machines in town enjoying multiple incarnations on the floor of Casino Royale. Casino Royale is a highly specialized gaming institution. For that reason, they do not offer anything outside of table and slot gaming. Drinks are free at Casino Royale and all you have to do is go up to the counter and order one to have it come through. In addition to that, there are also rewards programs available if you want them. When you combine all of the different elements of this casino together, the end result is a casino that is very special indeed. With excellent gaming selections and a good set of extras combined with a prime location, Casino Royale is in the top tier of Las Vegas casinos. With that in mind, it is no wonder that movies and books would want to borrow its name.